This den is really awesome. It demands skill at finding the den, then making sure nobody else finds it! So on your next visit to the woods try and track down any trees which are hollow. This can either be completely hollow, or ones with really big roots that have large gaps between that you can make a den from. Or even better – find an upturned tree. You can use the huge hole left by the roots or even the tree trunk and branches. To turn it into a den just gather loads of branches and interlink to make the den even better. Then use foliage like bracken and leafy branches to make it reasonably waterproof. 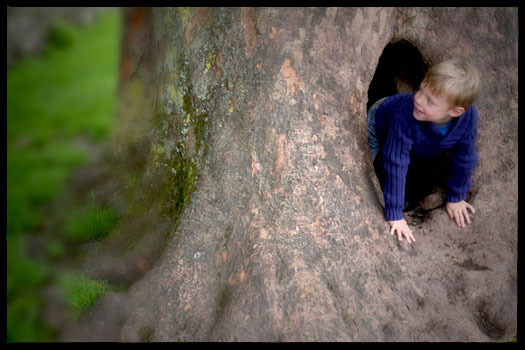 For the dens inside a hollow tree, scoop out the mud on the inside and use bracken or straw to make more snug. If you can keep the den secret, carve your initials into the walls for you to find in years to come. You could even put small shelves up to store provisions.